In this article, I'll show you the JSON objects and Angular/Node code to capture a credit card with the Stripe service. The code for this example project is on GitHub. It is a working project so the code may not be exactly like this article by the time you find it. Capturing credit card information for products, services, and subscriptions is easy with many tools provided by credit card processing companies. 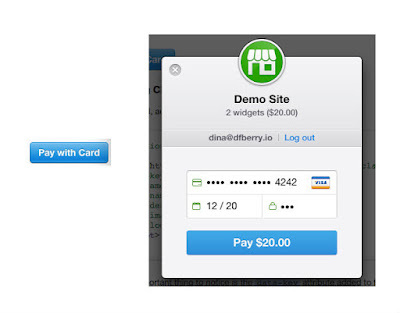 Stripe provides an html button that pops up a form to collect credit card information. It is incredibly simple and straightforward. You can control the form to collect more data. You don't need to know how to program it, and it works. Yeah! This article doesn't cover the easy route of button and pop up because Stripe did a great job of that on their website. If you would prefer to control the credit card experience from beginning to end, you may choose to build your own form and process the data you collect to meet your own business needs. If that is the case read on. A credit card number should never make it to your server – where you are liable for fraud or theft. Instead, the client-side code sends the credit card information to the processor, in this case Stripe, and Stripe sends back a token to the client-side code. The token isn't a charge to the card but more a promise to charge the card in the future. For the remainder of the customer's experience, you do not use the credit card information, only the token. The token travels with the rest of the customer information (name, address, items purchased) to the server. The server will make the actual charge and receive the resulting information from Stripe. With stripe, all you really need is a way to make an https request to their Api server, passing JSON, then receive the JSON request. That is true for both the token request and the charge request. Stripe responses with JSON. The rest of this article is broken into two different sections. The first section will review the JSON objects which have some requirements and a lot of optional fields. You can use any technology you want to make these, including curl. The second section will cover a specific code base of Angular on the client and Node/Express on the server. The code is very simple so there is little or no styling, validation, or error management. 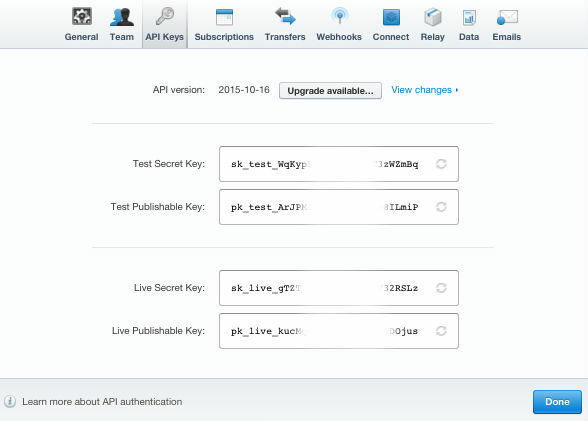 Stripe needs your Publishable key to create the token. You can find this on the Stripe dashboard in your account settings. Notice that only the key and card information is passed in the above curl. You can and should capture and pass the billing address. 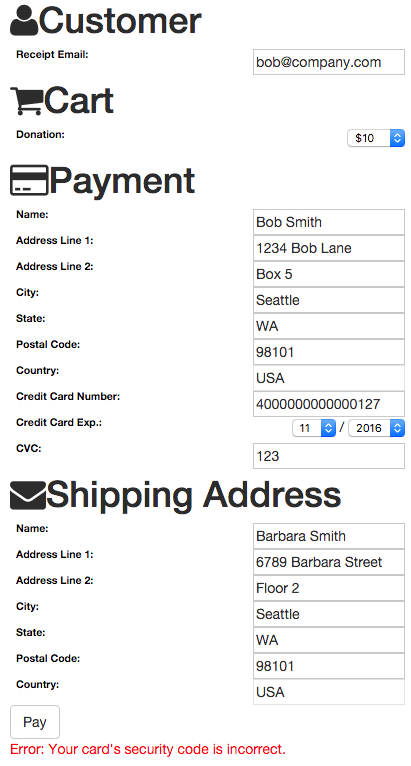 This allows you to see the address in the Stripe Dashboard when the card is finally made. Notice that you only see the last 4 digits of the credit card. The JSON object to request a token contains the credit card information. It should also contain the billing information for the customer. A full list of card key/value pairs is listed in the Stripe docs. The response will be a status code, success is 200 with a json object of data including the token. For the rest of the credit card transaction, use the token only. You will need to pass it when you charge the customer's credit card. Now that you have the token, you can create a JSON object to represent the credit card charge. Make sure the statement_descriptor has meaningful information to figure out the charge was valid– it shows up on the customer's bill. If you have information important to the transaction that Stripe doesn't collect, put those values in the metadata key. You can retrieve this information from Stripe to reconcile or fulfill the transaction on your end. Think of it as a backup – if your system goes down, Stripe still has enough information for you to rebuild the transaction. The amount includes dollars and cents but no decimal. So "1000" is ten dollars, $10.00. If you are new to Stripe, you may not be using their advanced features but if you collect the data now, converting to and seeding some of the advanced feature objects will be easy. A successful charge response returns an null error object and a result object. The two items you want to look for is status and paid. Stripe keeps a log of your transactions as JSON objects including the request and response of both the token and the charge. You may want to store all the information on your server, but if you don't, you can get it from Stripe when you need to. If you customer's charge fails, the JSON for the charge is a bit different. You will want to present the customer with the meaningful error message to help them correct the problem on their end and complete the transaction successfully. The charge object will be null and the status object will have the error message. The message contains the information to display to the customer. While the transaction didn't complete, the log in the Stripe Dashboard will contain the same information. For a complete list of issues, look at the Stripe api for errors. The example is a donation form. It collects the customer information and allows the customer to choose the donation amount. A shipping address is also collected, for a thank you card back to the customer. The web page has very little styling, no validation, and only a single error message if the credit card charge is denied. The Angular code includes a directive to display the html, a controller to collect the customer's information, and a service to post to the server. The token creation and charge are both handled in the service one call right after the other. This is definitely not ideal for a real-world situation. 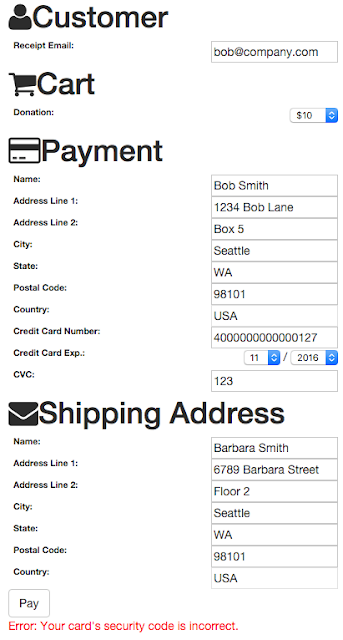 The card, card, and customer information are kept in JSON objects in the models.js file. The Stripe publishable key is in config.js along with the cart item name. When the token and charge are made, the JSON object that Stripe expects for each of these is created. As all of the Stripe work is in the service, that is the Angular code to review. The complete charge as 3 separate objects, cart, card, and customer. The server code is a node app using Express. It only serves the html page above and has an api to process a charge -- very lean in order to drop it into any other web site. Morgan is used for logging and Wagner is used for dependency injection. You can start the app with npm start or node server/index.js. The dependencies file creates the wagner dependency injection for the config and stripe objects. The main Stripe code of the application is in the api.js file to process the Stripe charge. Captures credit cards with Stripe is simple. You can use their button and form or create your own system. If you create your own client and server, understanding the JSON objects for the token request and the charge request is important. You can pass just the minimum or all the data you have. Create the token on the client and pass the token and charge details to the server to complete the transaction.